The Days of Johann, an agility dog! : A dog whisperer of another kind! A dog whisperer of another kind! I posted this on my other blog, Rescue Me, but wanted to share it with you too! "It was 9.45 in the morning and I was going to the pub to get blotto. My company had gone bankrupt and I had lost my house, my cars and all my money," he recalls. "Suddenly, I saw this border collie lying in the middle of the road, about to be run over by a truck. "I don't know why, but I called out 'Annie! ', as in Orphan Annie, and she ran straight over to me, the truck missing her only by inches. It was a moment that completely changed my life." No question about it. A rescue dog in more ways than one, Annie accompanied the newly impoverished Graeme and his wife, Maureen, to their new, downsized life in Devon ("We went there because at least the fresh air was free"). 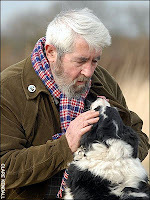 It soon became clear that, although he had in the past been a chef, a soldier, a gardener, a painter and the creative director of a large advertising agency, Graeme's true vocation lay in training - and talking to - dogs. Put simply, Graeme, now 71, believes that we all have the ability to communicate with our four-pawed friends, and they with us. "Everyone knows that if a dog is wagging its tail, it's happy, don't they?" he says. "What I do just takes things a stage further." I love seeing new ways that people communicate to pets. Great post!